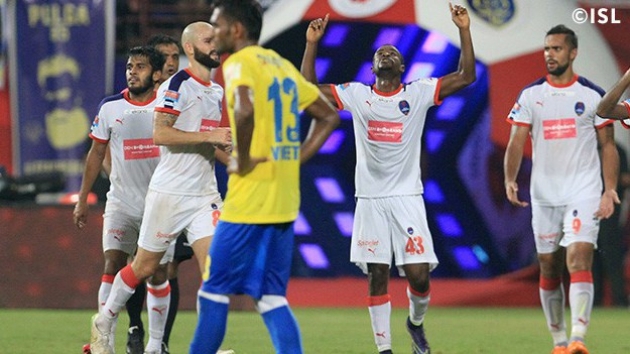 The 62,013-strong crowd at the Jawaharlal Nehru Stadium in Kochi witnessed a well-contested game but Kerala Blasters FC had to brave another defeat as they lost 1-0 to Roberto Carlos’ Delhi Dynamos FC in Hero Indian Super League 2015 on Sunday evening, courtesy of Richard Gadze’s late goal. With the win, Delhi took the second spot in the league on nine points from four matches, behind FC Pune City on goal difference, while after their second defeat from four matches, Kerala remained sixth. Both teams played a good first half, with Kerala Blasters taking the first jab. Fresh from his India stint, Cavin Lobo entered from the right wing with the match’s first shot on goal in the second minute. Competent football coming in from both sides, fans witnessed a display of deep possession and a series of alternating short and long passes. While CK Vineeth, Chris Dagnall and Victor Pulga were amongst the ones in charge of the constant raids on the Delhi Dynamos goal, Kerala Blasters faced a constant threat from the likes of Robin Singh, Gustavo dos Santos and Florent Malouda.